Being a contestant on American Ninja Warrior three times, as well as a lifelong gymnast, has taught MaryBeth Wang that you must fight for what you want. Wang left entrepreneur life in 2006. She had successfully started Jubilee Gym in 2000, as a mobile home school gymnastics program. MaryBeth came back to gym ownership with the support of her husband Chen, and a varied background as a gymnast and ninja. 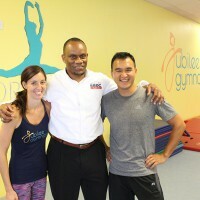 Jubilee Gym, based in Ruskin, currently offers gymnastics instruction as well as ninja training and sports fitness for kids ages 18 months to 18 years. The success of the business initially relied on what space was available. It started in a dance studio, and grew into a community center. “Each time we grow, our space needs increase as well,” Chen said. They started by taking seminars at the Florida SBDC at Hillsborough County – attending workshops on finance, marketing, bookkeeping, and more. Then, they decided to take advantage of the no-cost consulting services offered. “Right now, we’re working with our mentor Corey [McCaster] on the finance part and marketing. Those are the two biggies that we’ve needed the most help with,” MaryBeth said. Investing in their business education is paying off. In mid-July they hosted a grand opening with more than 500 people in attendance. Attendees were able to come into the gym and try everything out – including the mini-ninja course. They’ve also added more than 50 students since the grand opening. Part of the attraction for youngsters to Jubilee Gym is the ninja training. MaryBeth is a three-time competitor on the American Ninja Warrior circuit. The duo built a mini-course to train youngsters for the increasingly popular American Ninja Warrior phenomenon. “It makes our gym a little bit different than other gymnastics gyms out there,” Chen said. While their growth continues, the duo says they will continue to work with the Florida SBDC at Hillsborough County. “The biggest challenge for me is juggling everything,” MaryBeth said. “It’s grown so fast so just knowing how to handle that growth, how to walk through those hoops and do it well and not get too overwhelmed and burnt out has been the biggest challenge. "If you’re another small business that might be looking to expand or even start up, if you haven’t tapped into the Florida SBDC at Hillsborough County, there is a ton of resources –workshops, you name it. It’s been an amazing resource."